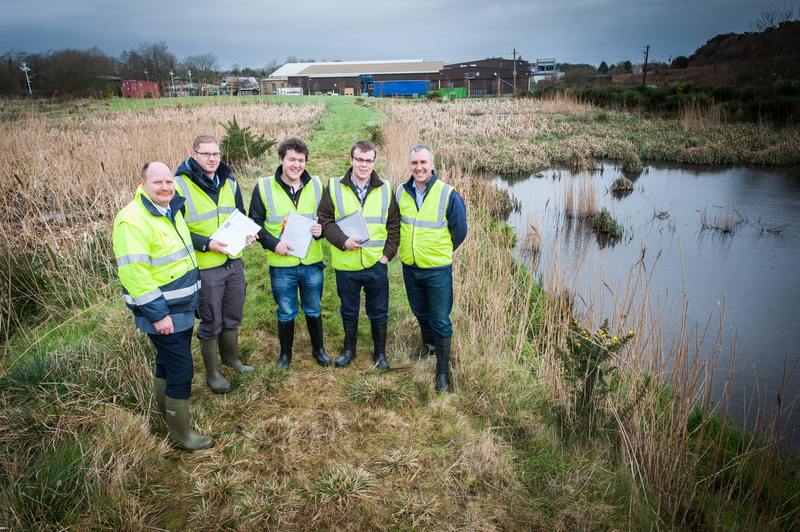 To mark World Wetland Day on Tuesday, 2 February, Dawn Meats and Waterford Institute of Technology (WIT) have announced the start of a study on the health and progress of the integrated constructed wetland at Dawn’s facility at Carrolls Cross in Co Waterford. Four students from WIT will carry out this assessment in the coming months, and the results will be available in the autumn. The students involved are Michael Kenny, P.J. McGrath, Ronan Kennedy and Lyndon Cox who are studying for a BSc (Hons) in Land Management in Agriculture at WIT. World Wetland Day aims to highlight the importance of wetlands, and the role they play in providing natural sponges against flooding, hosting a huge variety of life, and storing carbon dioxide to regulate climate change. Three years ago Dawn Meats installed a 7 acre integrated wetland and Eco-park at the facility. This not only reduced carbon emissions by avoiding the need to mechanically treat wastewater but provided an opportunity to enhance biodiversity at the site. Dawn and WIT carried out an initial survey of the wetland in March 2014 and they are now commencing a study to assess how the health of the eco-system has progressed over the last two years.